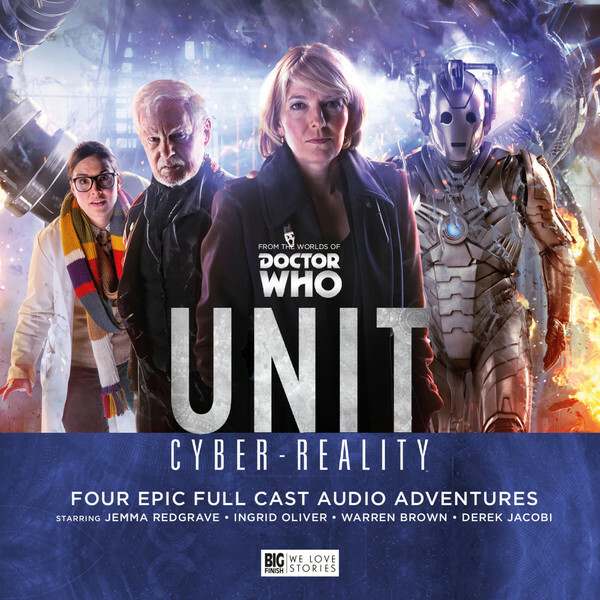 Cyber-Reality sees Big Finish continue to explore the modern world of UNIT with the continuing adventures of Kate Stewart, Osgood and the rest of the gang. The previous boxset, Encounters, introduced the Auctioneers, a fanatical group who collect alien artefacts and sell them on to the highest bidder, they are using virtual reality to hold its prisoners. But something else is using the world of virtual reality, something silver, something that used to be human. Game Theory picks up from where Encounters left off, Sam Bishop has gone missing, he is lost at sea with a very valuable hostage with Kate and Osgood subjected to a number of games to save him. The script from Matt Fitton brings together two main plotlines being brought together one left over from the previous set and the main arc for this set but they both have a common endpoint with Warren Brown giving us a very intense performance is UNIT’s trouble-shooter who must use his instinct and military training to piece together the mystery. Kate and Osgood have also got a lot to do here, with their rescue mission for Sam seeing them go from one dangerous situation to another. There are Krillitane codes to crack and rust eating viruses to defeat and Matt Fitton suitably ramps the stakes up, especially when Kate realises that they are being set up to fail by the mysterious Overseer. Jemma Redgrave and Ingrid Oliver are excellent as the double act of Kate & Osgood and their performances are brilliant as their characters begin to take the advantage and take the fight straight to the Auctioneers. 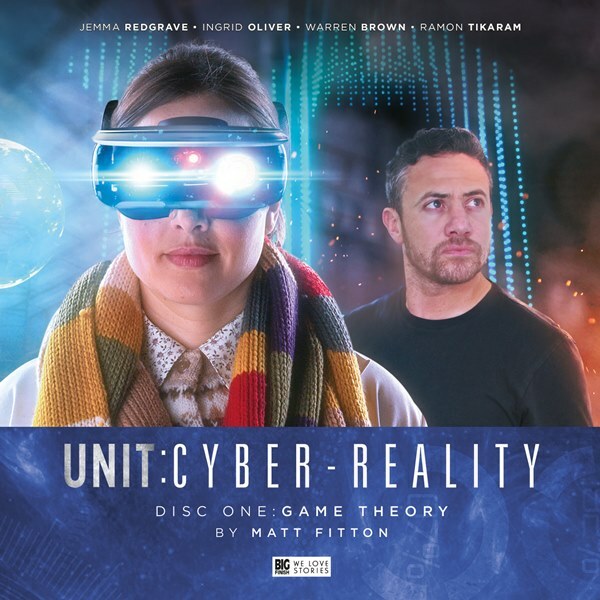 Game Theory is a highly enjoyable way to begin this set with the script from Matt Fitton really showing the strengths of those UNIT characters included. The performances are also brilliant, particularly from Warren Brown whose performance is so intense you are on tenterhooks the whole time. 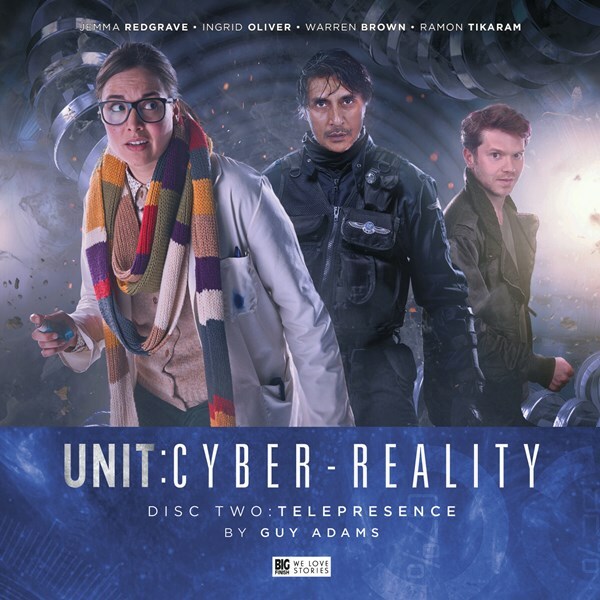 Guy Adams pens the next story, Telepresence which takes the idea of virtual reality and pushes it even further with Osgood, Colonel Shindi and Josh Carter being sent on a perplexing journey into a mysterious realm. It was fun to hear them all coming to terms with what they could and couldn’t do in their virtual reality and there are plenty of references and nods to previous Doctor Who adventures if you are really paying attention, especially when it comes to certain metal-meanies. We’ve got strange dogs and metal worms as well as super-speed and the idea of mind-over-matter in an arid desert. They must remain alive as they travel to the dark heart of this strange world. It was nice that Adams kept Sam Bishop suffering seemingly from his prolonged exposure to Auctioneers’ equipment. But things quickly take a turn for the worst for Sam, Osgood, Shindi, Josh and Kate as Adams also ramps the tension up and the stakes get higher as the real baddies become apparent. Code Silver, also from Guy Adams sees things go from bad to worse as Osgood, Shindi and Sam emerge partially converted to a Cyber-form. Kate mentions at one point that she could handle a group of Cybermen but up against Osgood she doesn’t stand a chance. There can be no denying that the Cybermen are one of the biggest threats to the Doctor Who universe with their many variations and upgrades especially given how parallel their origins are with humanities current technological status. But there are some body horror moments as we hear people having their individualities stripped away. Code Silver doesn’t deal too much with the consequences of cyber-conversion and Adams instead decides to explore the reasons why some of the Cybermen always seem different to the others. Knowing that some are vulnerable to gold, radiation and emotions, Kate goes on to arm herself and Josh with different weapons depending on which Cybermen they are facing. So much happens in this story that it would spoil it to talk about any further. It all comes to ahead with Master of Worlds in which the War Master, played by Sir Derek Jacobi pays a visit. What I love about the War Master is that he has this constant feeling that he is running. He just pops up, tries to find something or get away from somewhere and then moves on. This is still what happens this time, even if he gets a little caught up in the adventure. The Doctor would stay around to help the situation but the motivations for the Master “helping” are purely motivated by self-preservation and the desire to get back to his TARDIS. The Master has a long history with UNIT and because of this, The War Master can see that Kate is willing to take more extreme measures than her father was. The Master makes a brilliant point that they would be unstoppable if they just converted Kate and Osgood and the Master is at his best here when he is taunting Sam about his feelings for Osgood. The scene is excellently sinister and Jacobi is just vicious when he is trying to take people down. The War Master is easily one of the best incarnations of the Master and it is down to the excellent performance Jacobi gives us each time he comes around.